Stay for 01 Fu Golf, etc. Evening tea with Pakora & cookies . 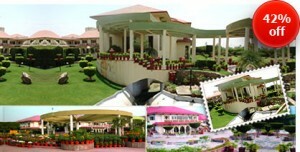 Behror is located on the Delhi – Jaipur highway around delhi. The Shiva resorts are on the highway which is approximately 130 km away from Delhi as well as Jaipur. The look of the resort gives a person a real feel and tough of typical Rajasthani architecture which was prevalent in the period of Rajas. This resort covers a whole area of 10 acres and is fully surrounded by lush greenery filled with every kind of flowers, vast span of gardens are spread till the eyes can see. Stay anytime till 30th June, 2011. One voucher code will be applicable for only one person. Package is applicable for couple booking only. If you have not decided yet or wants to customize tour itinerary or hotels listed above in "Book Shiva Oasis Resort Behror in Advance by Goibibo Rs.99/-", then we can change the travel itinerary and make a personalized, tailor-made holiday package, especially for you. We can modify this travel package as per your itinerary, budget, duration and the tourist places you would like to visit, including transportation and airfare should be included or not. Please fill the form below to contact us.